Item # 219445 WHOLESALE VARIETY LOT of ten different titles dating from the 1820's - 1890's, in average or better condition---not a damaged lot and no pulpish newspapers. A popular way to assemble a variety of titles at a low price. 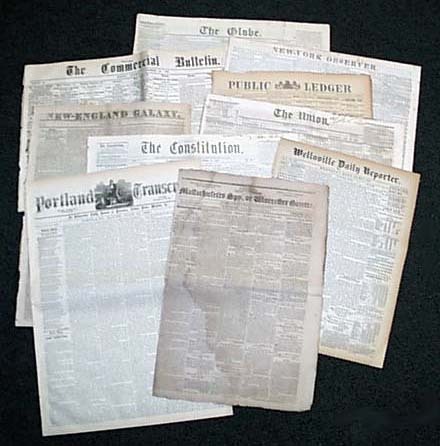 We will give you ten different American newspapers ranging from 1820 to 1899 (no pulp issues) in average condition with good reading. A wealth of varied issues for under $2.50 each. A great set for a great price. The image shown is representative of the look and condition of the issues you will receive. Actual issues vary.